"The Universe has as many different centers as there are living beings in it. Each of us is a center of the Universe..."
—Aleksander Isaevich Solzhenitsyn, The Gulag Archipelago: 1918-1956, Harper & Row Publishers, 1985, p. 3. Discuss why observers in different galaxies would each think that they are the center of expansion for the universe. Explain using Hubble's law. Correct. Explains how Hubble's law (recession velocity is proportional to distance) corresponds to the expansion of space between galaxies, such that each galaxy seems to be center of expansion as observed from their position. May use analogies as not-like-an-explosion, raisin bread, enlargement of between-spaces, etc. Contains right ideas, but discussion is unclear/incomplete or contains major errors. Typically Hubble's law discussion is missing or problematic. [20 points.] Discuss whether globular cluster stars in the halo of the Milky Way are expected to be metal-rich or metal-poor, and why. 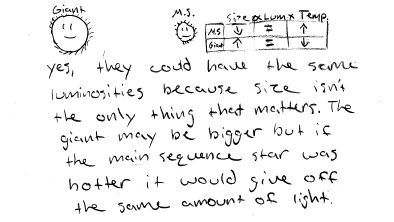 Explain using the properties of mass and stellar lifetimes, and the Milky Way. Correct. Globular cluster stars in the halo are the old first-generation stars that formed when the Milky Way was spherical in shape and are composed primarily of hydrogen with little metal content, as metal content increases over time due to stars fusing and releasing fusion products to subsequent generations. Nearly correct (explanation weak, unclear or only nearly complete); includes extraneous/tangential information; or has minor errors. Complete explanation of why metal-poor stars are older than metal-rich stars, but discussion of why the halo is the oldest part of the Milky Way is problematic, or vice versa. Contains right ideas, but discussion is unclear/incomplete or contains major errors. As (r), but discussion of why the halo is the oldest part of the Milky Way is missing, or vice versa. Limited relevant discussion of supporting evidence of at least some merit, but in an inconsistent or unclear manner. 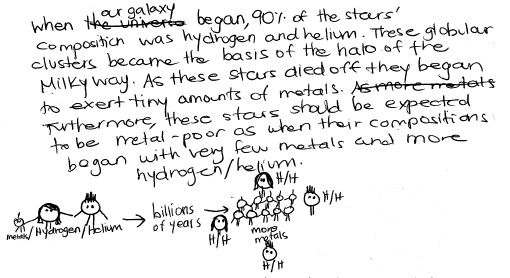 Has only problematic discussion of how metal-poor stars are old stars (e.g., metals are used up by stars over time). Implementation/application of ideas, but credit given for effort rather than merit. Implausible evidence/methods/discussion. [20 points.] 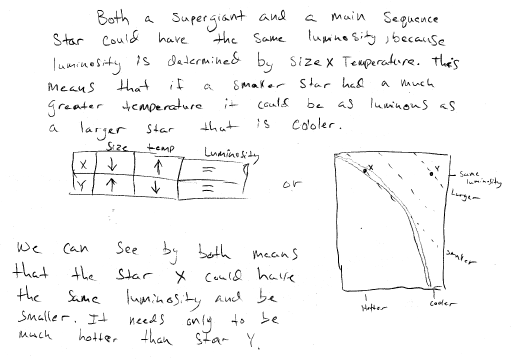 Discuss whether or not a giant star and a main sequence star could have the same luminosity, and why. Support your answer using Wien's law and/or the Stefan-Boltzmann law. Correct. 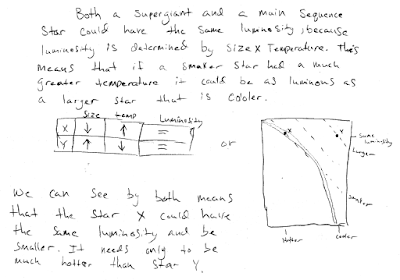 Discusses how the Stefan-Boltzmann law (luminosity (brightness) proportional to size * (Temperature)^4) explains that two stars can have the same luminosity if the smaller star is hotter, and the larger star is cooler. Contains right ideas, but discussion is unclear/incomplete or contains major errors. At least recognizes how the Stefan-Boltzmann law is applicable, but argument is garbled (e.g., has giant star smaller but hotter than main sequence star of the same luminosity). Limited relevant discussion of supporting evidence of at least some merit, but in an inconsistent or unclear manner. 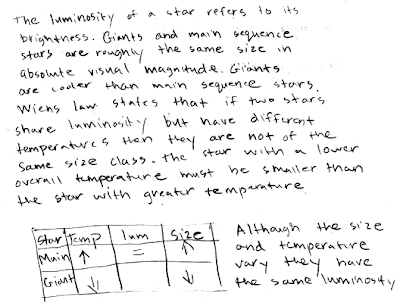 At least recognizes how size and temperature are relevant, but Stefan-Boltzmann law itself is garbled. (The following question was asked in the week/weekend subsequent to Midterm 2. (A) Not going to study. (F) Earlier than the week before. "the temp of the drink on the inside and the temp of the outside are different. if the outside is warmer you get the drops"
"the moisture in the air"
"they are from the outside being hotter than the inside of the can"
"the outside air around a cold cup causes the water drops"
"The air has moisture so when they meet the container, the two molecules stick"
"the water in air sticks to the glass"
"These drops are created when warm air in the atmosphere comes into contact with the cool surface of the container. The vapor in the air condenses on the outside of the container." "air molecules stick to the container"
"The air hits the glass which is cold and forms into water droplets"
"beverage is getting warmer causing some frost on the outside to melt"
"These drops came from the water in the air that gathered and stuck to the wet surface." "The temperature of the beverage is less than that in the atmosphere and will try to reach equilibrium with the atmospheric temperature. These water droplets develop by the water vapor in the air changing into liquid air by this thermodynamic reaction." "because the drink is cooling down so its making it dense"
"These drops come from the air around the object that the drops have formed on. The energy in the material in the air around the object is absorbed into the object, slowing the movement of the materials, and allowing the materials to 'fall towards' the object. This builds a layer of material that eventually forms a pool of like materials." "it cools its self off from the inside out"
"Condensation occurs when a liquid, cool object is heated by it's surrounding atmosphere. The drops are the product of this occurrence." "atoms ran into the cold glass and stopped, more atoms ran into those atoms and clumped together to form molecules which stick together to from droplets"
"Water vapor in air immediately next to the cold surface cools, allowing droplets to form." "does it come from tiny tiny holes in the container??" "These drops come from humidity coming from the air which lands on a cool surface such as the beverage container." "the water molecues cooling down on the outside of the cold beverage creating the condensation"
"the molecules in the air hit the cooler surface of the glass and stick there"
"when it adds matter one atom or molecule at a time from a surounding gas"
"they came from the particles sticking to the cold can"
"the cold can collected the moisture in the air..."
"Water vapor condenses into liquid after making contact with the surface of a cold container surface." "the condensation comes from excess humidity from the outside air. The glass only provides a cold surface on which humidity can visibly condense. When the warm, moist air comes into contact with the cooler glass surfaces, the moisture condenses." "the coldness from the beverage meeting room temperature"
"MMMM...not sure is it the Volatile substance?" "Condensation occurs when vapor is cooled to its dew point." "These drops come from moisture in the air that is warmer than the cold beverage and in direct contact these molecules slow down creating moisture on the surface, Heat Exchange." "somethin to do with it the temperature surrounding the beverage....i'm not sure"
"They came from the atmosphere. Water vapor in the atmosphere comes in contact with the cold surface of the container and condenses into liquid water." "These drops came from the air." "because the inside of the cup is colder than the out"
"they came from the can itself." "Condensation usually occurs when a parcel of rising air expands and cools. If it cools enough, some of the water vapor molecules clump together faster than they are torn apart from their thermal energy." "Warm moist air carries invisible molecules of water. When air gets colder it compresses (and if air gets hotter it expands, its volume increases). As the air cools, at a certain point the water molecules are unable to stay in the air as invisible 'gas' (water vapour), and they change their state from gas to liquid. 'Liquid' is a more condensed form than a gas. The molecules are closer together in liquids than they are in their gas form/state. If warm moist air meets the side of an icy glass, the water vapour in that bit of air 'condenses' into a liquid (water) on the side of the glass. answer provided by ask.com"
"its the temperature of the substance that is inside"
"water vapor in the air cools down and reverts to it's liquid state on the beverage." "the hot air around the container cooling"
"the warm air on the outside turns to liquid as it's cooled by the surface of the can....or something like that.."
"the small drops come from the cold beverage; as the beverage sits out in room tempeature longer its composition breaks down in is released in drops"
"it comes from the cold beverage warming up"
"Water vapor is condensing into liquid when making contact with a cold surface." "When water vapor in the air meets something cold its molecules clump together to form droplets." "the drops came from the water being cold enough to emit out side of the cup"
"The cold substance on the drink begins to melt, causing drops." "The beverage starts out with cold water molecules in the inside. As the molecules cool down, they begin to move about more slowly and draw closer together. If they are cooled down enough, they begin to stick together"
"comes from the vapor created by the contrast between the the temperature of the air and the temperature of the beverage... maybe..."
"Moisture sucked out of the air"
A wire of length 3.000 m with a cross section area of 2.2e-6 m^2 stretches by 0.012 m when a load of 900 N is hung from it. What is the Young's modulus for this wire? Y = (F*L)/(A*delta(L)) = (900 N)*(3.000 m)/((2.2e-6 m^2)*(0.012 m)) = 1.02272727...e+11 = 1.0e+11, to two significant figures. Response (A) is F*delta(L)/(A*L); response (B) is F*delta(L)*L/A; response (C) is F/A = stress. A wave has a frequency and wavelength of 220 Hz and 0.58 m, respectively. What is the speed of the wave? The wave speed is v = lambda/T = lambda*f = (0.58 m)*(220 s^-1) = 127.6 m/s, which is 130 m/s, to two significant figures. Response (A) is lambda/f; response (B) is 1/(lambda*f); response (D) is (f/lambda). A 0.75 m long string has a tension of 60 N. This length of string has a mass of 1.1e-4 kg. If the tension of the string were decreased by 10%, the fundamental frequency of the string would decrease by what percentage? such that the new fundamental frequency is 1 - 0.949 = 0.051 = 5.1% less than the original fundamental frequency. Response (A) reflects no change in the fundamental frequency. Response (B) is sqrt(10). A 0.75 m long string has a tension of 60 N. This length of string has a mass of 1.1e-4 kg. If the tension of the string were increased by 10%, the fundamental frequency of the string would increase by what percentage? such that the new fundamental frequency is 1.049 - 1 = 0.049 = 4.9% more than the original fundamental frequency. (A) stuck between two medium-sized boulders. (B) covered by dry-ice frost. (D) surrounded by rising waters from melting ice. (E) currently enroute to salvaging parts from the NASA Mars Spirit Rover. (A) evidence that a global cooling cycle is starting. (B) material from a new atmospheric layer of carbon dioxide. (C) material from stars that existed before the birth of our solar system. (D) characteristics of lunar soil samples. (E) pollen grains and seeds from before the dinosaur extinction. (A) the product of processes deep within Earth's core. (B) caused by the decay of unstable, ultraheavy elements. (C) antimatter particles from the big bang. (D) photons emitted by quasars. (E) protons accelerated by exploding stars and stellar winds. 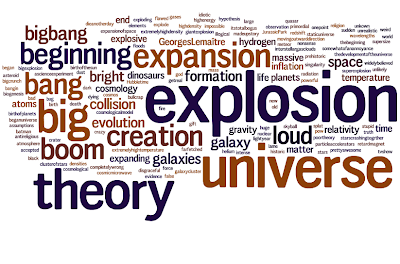 (A) Nucleosynthesis in the first few minutes after the start of the big bang. 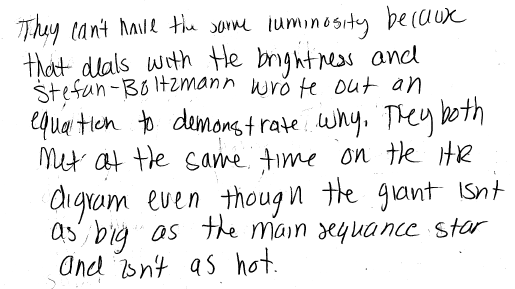 (B) Fusion reactions in the sun's core. (C) Fusion reactions in the core of another main-sequence star. (D) Nuclear reactions during a type Ia or type II supernovae explosion. Stars fuse hydrogen into heavier elements in their cores. Medium-mass stars have carbon as their end product of fusion; while massive stars have iron has their end product. However, type Ia supernova of these medium-mass stars as white dwarfs would result in heavier elements than carbon being made, and especially the type II supernova of massive stars would result in much heavier elements than iron, such as gold and silver. These heavy elements from a previous generation star's remnants would then be incorporated into the formation of Earth in the early solar system. "It all started a long time ago.... It was a simpler time back then-- the air seemed a little cleaner, the days a little brighter. All was well and all were happy... Then one fatefull day, all of that changed. The people of this careless little planet were doomed.. for little did they know an evil was growing, the likes of which would never be met in this storyteller's lifetime. And it all started on a little island in the pacific, on an average day, in an average house, a child born to two average people. But this was no average child. He didn't play in the sandbox, he measured the amount of meteorite particals in the sand. And he didn't watch tv, he watched the sky, plotting; biding his time till be would one day conquor all!!! Coming this summer. One man. One lecture hall. Highlander IV- the wrath of P-Dog!!! Did ya enjoy the plug for my new movie?" "Gold and silver in the Earth's crust is produced by the fusion reactions in the core of another main-sequence star and the fusion reactions in the sun's core." "the reaction in the suns core produced the gold and silver"
"Atoms heavier than iron were created during rapid nuclear reactions during supernova explosions, gold and silver being two of them." "supernova's release neutrons and they have no repulsion"
"Stars fuse elements up to iron, heavier elements are formed during supernovae." "how can exploisions from other stars add gold and silver to the Earth's crust? doesn't seem right"
"The fusion of two nuclei with lower mass than iron generally releases energy while the fusion of nuclei heavier than iron absorbs energy; vice-versa for the reverse process, nuclear fission"
"Heavy metals were created at the big bang"
"I think i read it in the book." "Both fusion and nuclear reactions were involved." "The heavier elements were created in the suns core through fusion. When the solar system was formed these elements attached to the earth." "through all the tempetures in the the earth heips create it as well"
"Lots of heat and fusion"
"The explosion created heavy metals like gold and silver which became the basis of earth's crust." "i put i'm lost....because i'm lost"
"Gold created as byproduct of supernovae, flung through space to other developing stars/planets." "the gold and silver within minutes nucleosynthesis occurs"
"normal matter and particles of antimatter." "fusionism centralates the central nalgistic and forms collaberation in the drantaieeasm which travels from the core fusion to the crust and disscombobulates the balance of elements a and b...(a being gold and b being silver) thus proving why i chose my answer"
"The elements are scattered out after a supernova." "I'm lost, and don't know how to answer this." "Star starts to collapse. The collapse can trigger a supernova explosion which will seed the interstellar medium and the dust clouds with the elements created during its lifetime. And the intense heat and pressure of the explosion can create elements heavier than iron (gold, silver, uranium, lead, etc.) and those are also expelled into the interstellar medium." "As usual I have no idea." "I don't know, I figured that a supernovae could create that." "As the sun gets older the heavier the elements the sun will start to fuse and when it explodes all of these elements are released and created all the elements of the periodic table"
"I'm not sure it makes since to me that it would happen in the core of something." "heavier elements than hydrogen or helium form in the cores of other stars, so one of these stars may have gone through a supernova. The intense heat make the elements heavier than iron and the explosion shoots the material out and maybe creating the earth." "Well I selected it because, I was lost. And didn't know how to answer it." "I feel it would take a combination of things, to create both gold and silver as they are two different things." "i guessed? didnt want to cheat and look at text book"
it was the supernovea cuz it was the only time to fuse the lighter and heavier elements"
"Fusion reactions in the core of any star." "actually to be quite accurate i'm not ready to give a definitive answer. were it "____ is a widely accepted theory for why..." i would say D because it is widely accepted." "I can't find the answer!" "I don't know if thats the answer, but I think I remember hearing that." "Only nuclear reactions from a type Ia or type II supernovae explosion can create enough energy to fuse lighter elements into elements as massive as gold and silver." "i dont really know the answer to the question"
"i'm not sure how to answer this"
because nuclear reactions create gold and silver." "umm well the gold and silver were made from fusion but it couldn't have been from the sun because the sun is still fusing its hydrogen together." "Not sure, figured gold could be created from fusion reations from either"
(A) are companion stars of neutron stars or black holes. 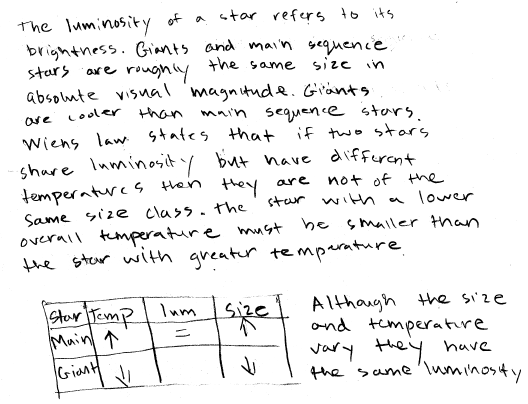 (B) have periods are correlated with their luminosities. (C) contain trace amounts of dark matter. (D) are brighter than O- and B-type main sequence stars. Since Cepheids have periods are correlated with their luminosities (as they go through their instability phase in their giant stage), then their "true brightness" (absolute magnitudes) can be used with their apparent magnitudes, in order to determine their distances. Why is only a small portion of the entire Milky Way visible to the naked eye? (B) Gas and dust block visual wavelengths. (C) There is too much dark matter. (D) Distant stars are receding faster than the speed of light. Approximately 1% of the entire Milky Way disk visible to the naked eye, due to the presence of interstellar matter that blocks visual wavelengths. Longer wavelengths of light such as infrared and radio waves do make it through this interstellar matter, allowing a map of the spiral arm structure of the Milky Way to be constructed from IR and radio telescope observations. (A) it slows down and compresses. (B) it gathers more interstellar material. (C) it will collide with dark matter. (D) its metals will break down into non-metals. According to the density wave theory, a gas cloud passing through a spiral arm does not collect new material to make new stars, but compresses as it encounters a "traffic jam" located there, which triggers new star formation. (A) the sun has metal absorption lines. (B) not all globular clusters have the same age. (C) globular clusters have randomly tipped, elliptical orbits. (D) the halo is composed of dark matter. According to the monolithic collapse model, the Milky Way evolved from a spherical shape to its current disk shape, leaving behind the globular clusters out in its halo. Thus globular clusters should all have the identical (old) ages (as determined from the lack of metal absorption lines, and their H-R diagram turn-off points), while the disk should be comprised of mixed age (old and newer) stars. However, the presence of globular clusters of different ages indicates that they may have been inherited from smaller dwarf galaxies. 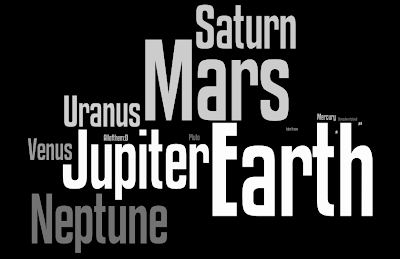 Wordle.net tag cloud for "favorite terrestrial planet" and "favorite jovian planet" generated by responses from Astronomy 210 students at Cuesta College, San Luis Obispo, CA (http://www.wordle.net/show/wrdl/1324952/Untitled). Plu- oh, right... well I GUESS it'd be Earth. Earth. They don't have VitaminWater on other planets. VitaminWater. Try it. (C) Nibiru, a planetoid supposedly colliding with Earth in 2012. (D) a new supermassive black hole near the Milky Way center. (E) technological sources of nuclear energy being released. What is notable about the gamma ray burst detected by the Gemini North Telescope in Hawaii last April, recently published in a peer-reviewed journal? (A) Most energetic explosion known. (B) Disputed as an instrument calibration error. (C) Echo of the original big bang. (D) Seen to be evolving backwards in time. (E) Earliest explosion yet observed. What have scientists determined to be most likely cause of an atmospheric blast over Indonesia in early October? (D) The Large Hadron Collider in Switzerland. 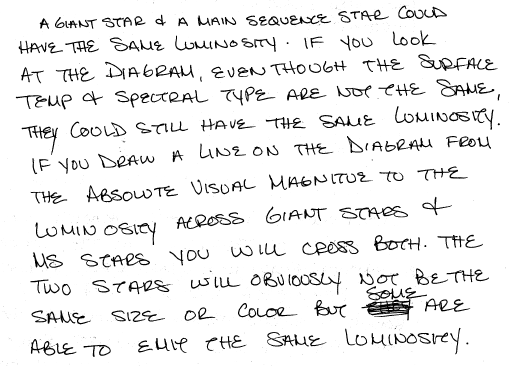 "You're crazy and seeing things"
"the gases are still around"
"its many many light years away"
"the sun is behind the star"
"It takes many lightyears for the image to reach us." "Yes, because if it's many lightyears away, it could take a long time for light to catch up to us"
"space-time stretches photons giving them longer wavelengths...also known as redshift duh!" "The light has just reached earth, as it takes time for light to travel just like anything else." "It can be so far away that the speed of light is too slow, causing us to have a delay on seeing the star die." "it's possible to see the nebula that if formed into"
"Light takes a long time to reach earth from distant stars, it is not instant." "the light is still traveling even after it's stopped being produced"
"the nova hasn't reached us yet"
"Since it is so many light years away, it would take that many years to see that the light has stopped." "Were on a different time schedule than space." "because the star is so far away that it takes a long time for the traveling light to reach us"
"The light source is out, but because it's so far away, the last of the light hasn't reached us yet." "star is really far away"
"using a high powered telescope"
"because we are x ammount of lightyears away from that star and it takes a long time for that light to reach the earth." "it takes a very long time for its light to reach Earth"
"So far away that the light we see is from when it was still alive"
"Light travels at a certain speed to reach us." "if its like a million light years away, the light is still traveling even though the star has died"
"It would take a long time for the absorption lines to come into view." "The time in which it takes for the light from the start to reach the Earth could take longer than the stars lifetime." "It would have to have died at a distance, for it takes time for light to reach earth"
"because light can only travel a certain speed so it takes a while for it to get to earth"
"yes, because of the speed the visual light travels." "because it takes a long time for light to travel"
"i dont have a clue :("
"When the star is really far away the light takes so long to get to us that even if the star is dead, light from the star can still be coming towards us many years later." "they are many light years away so the light that star gave of would take a long time to die out." "Emitted gasses from a companion star"
"Because the stars themselves are millions of lightyears away meaning it takes a ridiculous amount of time for the phonons to reach us. so those photons were sent before the star died and we are just now recieving them (almost like a letter from a person before they go to battle and that can be read even if he dies before it arrived elsewhere)." "Its so far away that the light is still traveling to us from when it was still alive. We live in a really big area :)"
"it takes thousands of lights years for the light of the star to reach us so even if it died its lights will still reach us thousands of years after it died." "Even though the star already died, its was so far away that its light is finally reaching Earth." "If a star is many light years away it will take the light from that star many years to reach Earth." because it becomes either a white dwarf, neutron star or black hole"
(A) Extremely old stars that formed a long time ago. (B) Young stars that formed very recently. Stars fuse hydrogen into heavier elements in their cores. When short-lived massive stars die in type II supernova explosions, these heavy elements are incorporated into the next generation of stars that form from interstellar matter, and thus newer stars will have more metals in their outer layers. 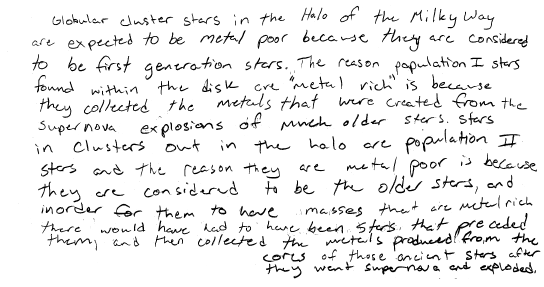 "Young stars are population I stars are relatively metal rich." "old=poor in metals. new=rich in metals." "young stars have less helium"
"because young stars are picking up metal made from old stars"
"because they use more energy"
"young stars are abundant in metals because they are using fusion and old stars do not." "Population 1 stars are younger because they are in the disc, and population 1 stars are more metal rich because of recycled pollution of metal in the air. So the newer the star, the more metal." "old stars blow up and shed their metals to the younger generations"
"New stars are more abundant because they have absorbed the metals expelled by older stars." "Stars begin with a lot of metals and release them into space as they grow older." "old stars may have already used up their hydrogen"
"Old stars have begun to fuse atoms into larger elements because they have already fused all of their hydrogen together to make helium"
"Young starts are made from the excess junk left by dead starts." "there's no metals in old stars..."
"We talked about it in class." "Both have metals on the inner core because they first use up the elements with the least work needed to be done." "I just think it's the bigger stars because they leave metal behind to form younger stars." "the small stars are buliding too become bigger stars in that prosess the sallow up all the metals that the bigger stars lose over time." 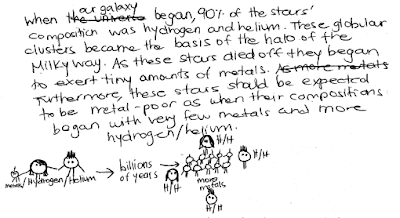 "thats what my notes say"
"Older stars formed at a time when the galaxy was poor in metals. Since that time, the galaxy has become more rich in these metals, so the newer stars forming in the galaxy are likewise more rich in metals." "sorry i don't know why.."
because the old stars already used all the hydrogen and imploded or exploded giving all the metals to the newly forming stars." "Older stars have shuffed off their metals." 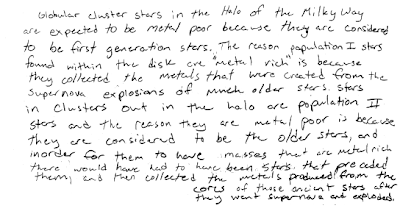 "cuz they start with all this metal and so thats how it is"
"Because they haven't expended any yet"
"They form from all the dust and other stuff in the universe." "The younger stars because they are collecting more rapidly..."
Revised Wordle.net tag cloud (revised) for "big bang" generated by responses from Astronomy 210 students at Cuesta College, San Luis Obispo, CA (http://www.wordle.net/show/wrdl/2179745/Untitled). bullcrap antireligious illogical farfetched truth? 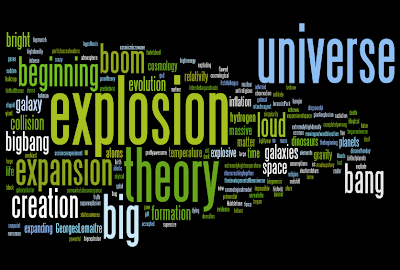 Original Wordle.net tag cloud for "big bang" generated by responses from Astronomy 210 students at Cuesta College, San Luis Obispo, CA (http://www.wordle.net/show/wrdl/1298566/Untitled). d = (P_2 - P_1)*((1.013e+5 Pa)/(1 atm))/(rho_oil*g). Response (B) is P_1/(rho_oil*g); response (C) is P_2/(rho_oil*g); response (D) is (P_2 + P_1)/(rho_oil*g). A 1.0 m ruler and a 2.0 m ruler are made of the same material (and therefore the 2.0 m ruler is twice as massive). 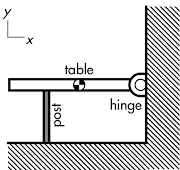 What is the ratio of the rotational inertia of the 1.0 m ruler to the 2.0 m ruler, if they are both pivoted to swing about their ends? which is response (B), to two significant figures. Response (A) is (1/2)4 to two significant figures; response (C) is (1/2)2; response (D) is (1/2). τpost = m·g·(L/2) = (6.2 kg)·(9.80 N/kg)·(0.40 m) = 24 N·m. Water flows through a pipe with a speed of 1.5 m/s through a pipe of 0.10 m inside radius, at point . The pipe has the same inside radius of 0.10 m at point , at a height higher than point . Assume ideal fluid flow. What is the volume flow rate of water at point ? The volume flow rate is given by A*v, where the area A = pi*r^2, and v is the speed. Response (B) is 2*pi*r*v (circumference times speed? ); response (C) is v/r (angular speed? ); and response (D) is v^2/r (radial acceleration?). Water flows through a pipe with a speed of 1.5 m/s through a pipe of 0.10 m inside radius, at point . 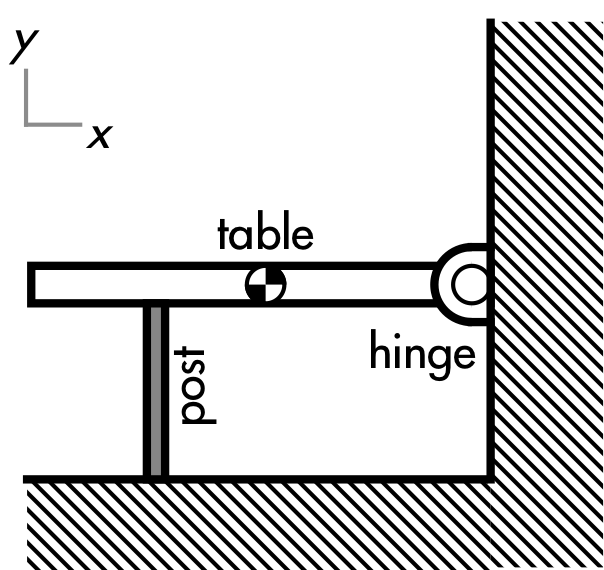 The pipe has the same inside radius of 0.10 m at point , at a height lower than point . Assume ideal fluid flow. A U.S. planetary scientist charged with attempting to sell classified information was previously involved with investigating what feature of the moon? (A) Subsurface ice in shadowed craters. (B) Detection of stranglets in Apollo mission lunar soil samples. (C) Supposed nuclear blast tests on the far side. (D) Falsification of Apollo mission moon landings. (E) Disputed theories of the origin of the moon. How did the European Space Observatory in La Silla, Chile detect the 30 newest exoplanets, bringing the known total to over 400? (A) Reflected radio signals from Voyager 1/2 probes. (B) Observing these planets passing in front of their stars. (C) Wobbles these planets exert on their stars. (D) Laser light reflected off these planets. (E) Radio signals from planetary magnetic storms. (A) greater core pressures and temperatures. (C) greater amounts of unstable heavy elements. High pressures and temperatures are required to initiate fusion (whether proton-proton or CNO cycle), in order to overcome the repulsive forces between positively charged nuclei. Greater pressures and temperatures in cores of massive main-sequence stars will result in faster fusion rates, and thus brighter luminosity than medium-mass main-sequence stars. A white dwarf requires a __________ companion in order to have a type Ia supernova explosion. A white dwarf needs additional hydrogen in order to undergo either nova or type Ia supernova explosions, of which can only be contributed from a giant companion from the above choices. (A) have unbalanced pressure-temperature thermostats. (B) accumulate greater amounts of unstable heavy elements. (D) fuse hydrogen more rapidly. Massive and medium-mass stars only fuse the hydrogen contained within their cores during their main-sequence lifetimes. Although massive stars have proportionally larger cores than medium-mass stars, the massive stars are disproportionately more luminous, and thus have much faster fusion rates than medium-mass stars, and accordingly live much shorter main-sequence lifetimes until the hydrogen in their cores has been depleted. 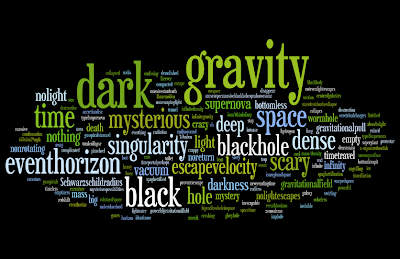 Wordle.net tag cloud for "black hole" generated by responses from Astronomy 210 students at Cuesta College, San Luis Obispo, CA (http://www.wordle.net/show/wrdl/1276159/Untitled).